We are gathered here today to mourn the loss of Cabell County’s much beloved swing sets. They will be dearly missed. Year after year, these swing sets have exhilarated the children of southern West Virgina while promoting their perceptual skills, spatial awareness, general fitness, social interaction, and sensory integration. Cabell County’s swings never meant to harm anyone. It is true that children sometimes liked to jump off them, thinking they were Superman, and that one such child broke his arm, perhaps due in part to inadequate safety surfacing. Yet we cannot help but lament the tragic decision made by this youngster’s parents to file a lawsuit, thus depriving all Cabell County youngsters of the chance to develop crucial skills, not to mention the chance to touch the sky with their toes. 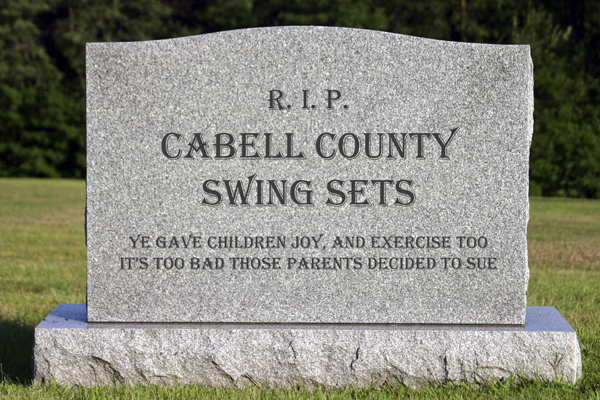 Friends and fellow play advocates, please join us in paying tribute to Cabell County's swing sets as we grieve their premature passing. UPDATE: Cabell County's swings may rise from the dead! The removal was halted by the state because of a state law that requires elementary schools to have swing sets. However, the swing seats and chains are being stored elsewhere until the district is able to address safety surfacing issues. Here's hoping they will be resuscitated soon. These playgrounds are for babies!